Input your lorry/large vans dimensions and you will only be routed along suitable roads avoiding low bridge heights, narrow roads, roads unsuitable for HGV's and large vehicles, etc. 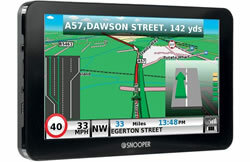 Truck sat navs to buy at ActiveGPS include the following manufacturers: Garmin, Snooper and TomTom. ‣Designed for HGVs, trucks, lorries, vans, etc. You couldn’t have missed the almost weekly press reports of a truck or large vehicle getting sent along an inappropriate route by an inept sat nav system. Almost all these stories end in disaster with the vehicle concerned stranded in a field, wedged under a bridge and even destroying property. It is reported that there has been millions of pounds worth of damage caused as drivers use sat nav systems designed for cars to navigate commercial vehicles. More recently (January 2017), the Local Government Association (LGA) wants to bring in legislation that would see lorry drivers in England and Wales being banned from using sat-navs specifically designed for cars and see them use instead use GPS sat nav system suitable for HGVs. Read the full story. The unique software found in truck sat navs will create a route based on the attributes of your particular vehicle. Simply enter into the truck sat nav the size and weight of your vehicle, plus the type of load if applicable and the truck software will calculate a safe, truck friendly route. Routes will be calculated based on roads with adequate width and height, excluding roads with low bridges or weight restrictions plus many other hazards. With larger dashboards in trucks and HGVs, a 3.5-inch display simply wouldn't be large enough to be clearly seen. 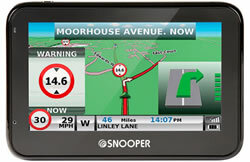 That's why truck sat navs like the Snooper S2700 Truckmate start with a screen size of 4.3-inch. 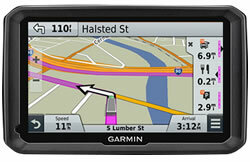 Some truck nav systems like the Garmin dezl 580LMT and Snooper SC5900 DVR all offer a slightly larger screen at 4.3-inch and 5-inch respectively. 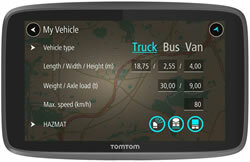 The TomTom GO PROFESSIONAL 620, 6200 and 6250 all feature 6-inch touchscreens. While the top-of-the-range models like the Garmin dezlCam 785LMT-D and Snooper S8110 Truckmate offer a very large and easy to read 7-inch windscreen display. 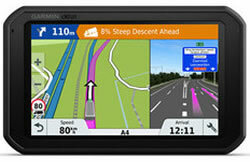 All of the Garmin, TomTom and Snooper truck sat nav models available from ActiveGPS are preloaded with European maps. All sat nav models also have a car navigation mode, so if you switch from driving a truck to driving a car you can take the sat nav with you. Other fields include truck type (truck, trailer, delivery, public) and load type (none, hazardous, explosive and flammable, harmful for water). Once this information is input, the satnav will calculate a route based on your vehicle type, size and load. It will make sure your journey avoids low bridges and narrow roads etc. As well as routing you safely and effectively to your destination, Sat Navs will also guide you along the most economical route. For example, faced with a choice of a route using a steep incline or one with more straightforward flat roads, the sat nav will select the latter resulting in improved fuel consumption and cost effectiveness. The map diagram to the right shows this in action. The red route is the normal car route with a low bridge. The blue route is the truck friendly route avoiding the low 4.4m height restriction bridge under the railway line. 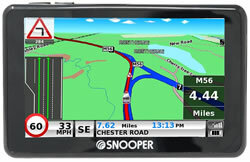 Snooper Truckmate will save you money! 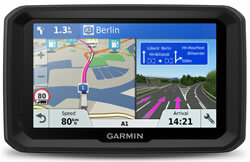 Research has shown that sat nav users will save money over time. 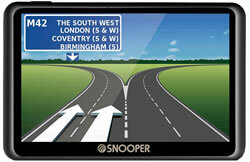 By using a satellite navigation to find the shortest or most economical route you will save 16% fewer miles driven on each journey and thus also a 16% saving in fuel expenses making this Snooper Truckmate pay for itself. 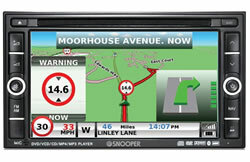 Although sat navs have obviously been designed to navigate when driving a truck it also has a car setting. Simply switch the sat nav to car sat nav mode (and buy the relevant car mount if the lorry mount is unsuitable) and it will navigate you on the most effective routes for your car instead!